The malfunctioning of a single human gene causes an autism-spectrum disorder called Pitt Hopkins Syndrome. The syndrome has profound impacts on intellectual development and cognition, mobility, breathing, digestion and other functions. Notably, it affects communication: Most people with Pitt Hopkins are unable to use language, even sign language. In recent years, a handful of researchers have made great strides in understanding Pitt Hopkins. And one of them teaches at Bates. 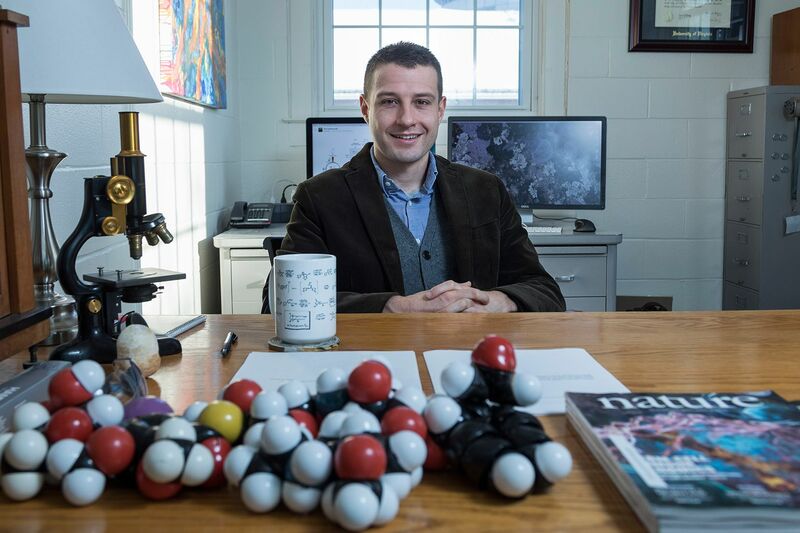 Assistant Professor of Chemistry Andrew Kennedy, who joined the Bates faculty in August, is among the disorder’s first and leading researchers. And the work that he’s doing with his Bates students may be bringing a therapeutic approach to Pitt Hopkins within reach. Pitt Hopkins is extremely rare. Fewer than 600 cases have been diagnosed worldwide. Until this decade, Pitt Hopkins research was minimal, although its genetic connection was discovered in 2007. Kennedy’s Pitt Hopkins research is a facet of his broader investigation into how cognition, specifically memory formation, is affected by so-called epigenetic factors — biochemical mechanisms that control how genes are organized. Kennedy’s research has attracted about $427,000 in grant support to Bates in all. His broader investigation is being funded by a $339,300, three-year grant from the INBRE Investigator program, part of the Maine INBRE award from the National Institutes of Health, administered by the Mount Desert Island Biological Laboratory. That investigation is focusing on ways that, in non-diseased brains, a process called DNA methylation affects long-term memory formation. In addition, Bates has received $88,000 from the Pitt Hopkins Research Foundation, a volunteer nonprofit established by families of children with the disorder, to support Kennedy’s Pitt Hopkins–specific research. “Pitt Hopkins syndrome, although rare, is a ruinous disease,” says Matt Auer, vice president of academic affairs and dean of the Bates faculty. 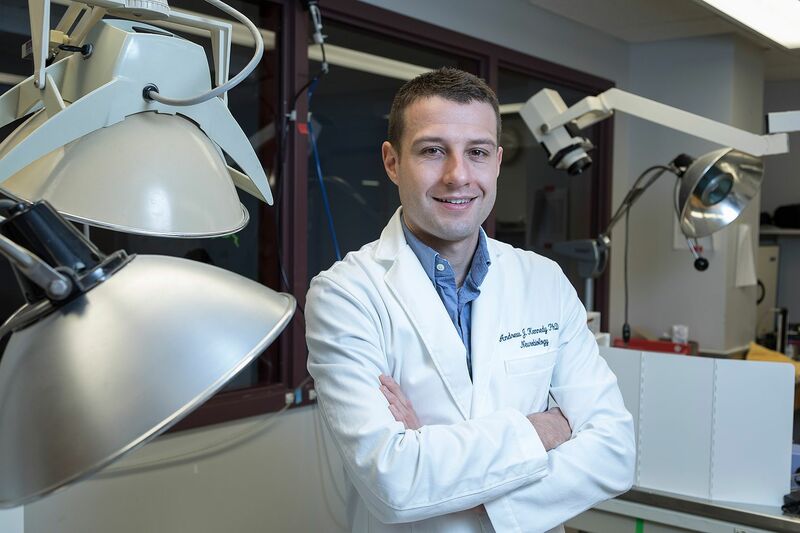 “When Andrew applied for the Bates chemistry appointment, his postdoctoral research on DNA methylation and its impact on long-term memory formation got the attention of my colleagues in chemistry and neuroscience. Founded in 2012, the Pitt-Hopkins Research Foundation essentially inaugurated Pitt Hopkins research when it reached out to J. David Sweatt, a neurobiologist then at the University of Alabama at Birmingham. The first molecular neurobiologist in the U.S. to investigate the disorder, Sweatt hired Kennedy as a postdoctoral research associate in 2012, and the pair went on to create the first mouse model of Pitt Hopkins — a fundamental advance, as it gave them and other scientists a basis for further study of the disorder. Sweatt and Kennedy capitalized on the fact that there are drugs that “affect gene expression in kind of a wholesale way, called epigenetic modifiers,” says Kennedy. He works specifically with a category of modifiers called histone deacetylase inhibitors, or HDAC inhibitors. They correlated genes known to be affected by HDAC inhibitors with the genes involved with Pitt Hopkins. One drug in particular emerged from this detective work: Vorinostat, marketed as a cancer treatment under the brand name Zolinza. “We treated the Pitt Hopkins mice with the drug, and it profoundly improved their capability of learning and remembering,” Kennedy says. It was an electrifying discovery — all the more so because Vorinostat has already been approved by the U.S. Food and Drug Administration, albeit for a different use. “So there’s a possibility that we can now look at this in a clinically controlled trial setting,” hopefully within five years, says Kennedy. At Bates, Kennedy’s PHRF-funded work will pursue the Vorinostat angle from two directions. First, he and his students will continue to scrutinize specific genes affected by Vorinostat. Second, they will investigate the potential of other FDA-approved HDAC inhibitors for treating Pitt Hopkins. Moreover, the INBRE-funded study will have a bearing on the Pitt Hopkins work. HDAC inhibitors require ongoing use to be effective, but therapies that target DNA modification, specifically DNA methylation patterns, may have longer-lasting effects on cognition. While the number of known Pitt Hopkins cases is only in the hundreds, the work being done by Kennedy and other scientists in the field reaches beyond that single disorder: a growing body of scientific evidence shows that single-gene disorders like Pitt Hopkins hold clues to understanding afflictions that are vastly more common.